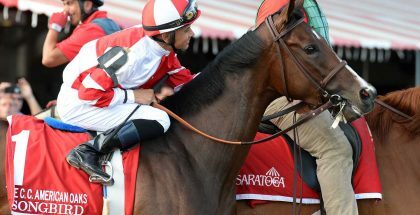 Kicking off a fantastic day of graded stakes at Saratoga was Sheer Drama (Burning Roma – Riveting Drama, by Notebook) with her victory in the Personal Ensign (GI). The five-year-old chestnut mare has finished first or second in all seven of her starts this year and most recently took the Grade I Delaware Handicap in July as her first Grade I victory. Content to stalk the two pacesetters of the Personal Ensign, Stopchargingmaria and Untapable, Sheer Drama edged up on the outside of that duo along the final turn. She was kept to task by jockey Joe Bravo and hit the wire 1-1/4 lengths in front of runner-up Got Lucky. Unbridled Forever (Unbridled’s Song – Lemons Forever, by Lemon Drop Kid) seems to be on the rise following her solid victory in the Ballerina Stakes (GI). 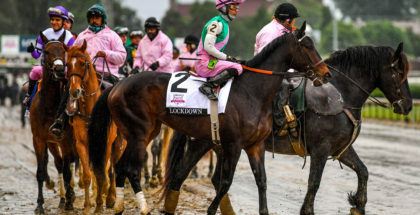 The four-year-old filly is familiar with hitting the board in big graded stakes events, including top three finishes in the Kentucky Oaks (GI), Acorn Stakes (GI), and Coaching Club American Oaks (GI), but she had yet to claim her own victory in one. Prepped with a victory in the Shine Again Stakes, Unbridled Forever exited the gate of the Ballerina as the second favorite behind Dame Dorothy. She settled at the back of the pack and saved ground in the early stages of the race and rallied around the turn, inching away to a one-length victory over Kiss to Remember. Making only his second start in graded stakes company, Runhappy (Super Saver – Bella Jolie, by Broken Vow) was able to make it to the finish line first in the King’s Bishop Stakes (GI). In five lifetime starts, the three-year-old colt claims victories in his debut and two allowance claiming events along with a dismal ninth-place finish in the LeComte Stakes (GIII). Runhappy would leave no doubt of his potential in the King’s Bishop, however. Breaking from the outside eleventh post position, Runhappy went straight to the front and remained there, ultimately pulling away from all challengers to win by four lengths in stakes record time. Another wire-to-wire victory followed Runhappy’s exhibition when Private Zone (Macho Uno – Auburn Beauty, by Siphon) took the Forego Stakes (GI) in similar fashion. 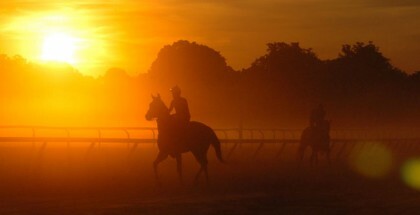 The six-year-old gelding is a veteran of such major stakes races, owning victories in such races as the Vosburgh Stakes (GI), Cigar Mile Handicap (GI), and Churchill Downs Stakes (GII). Also starting from the eleventh post position, Private Zone broke extremely well and settled into the front-running position. 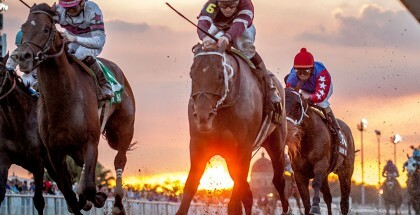 Although his rivals ran nearby, none ever challenged him, and Private Zone cruised to a 3-3/4-length victory over The Big Beast, his closest rival. Flintshire (Dansili – Dance Routine, by Sadler’s Wells) secured his place in the Breeders’ Cup Turf (GI) with his victory in Saratoga’s Sword Dancer (GI). Bred in Great Britain, the five-year-old horse was a Group I winner and traveled to the United States in 2014 to run in the Breeders’ Cup Turf, an expedition that resulted in a respectable second-place finish. Flintshire’s race in the Sword Dancer was his first American run since then, and this second attempt paid off. Running as the favorite, Flintshire broke awkwardly but seemed to recover well enough as he bided his time in fifth. With five-sixteenths left to run, Flintshire stole the lead from Guardini and proceeded to take the race in hand by a 2-1/2-length margin. Although thousands thronged to see Triple Crown champion American Pharoah, the gutsy Keen Ice (Curlin – Medomak, by Awesome Again) stole the show in the Travers Stakes (GI). The bay son of Curlin has run in the shadow of American Pharoah in their last two races, finishing third in the Belmont Stakes (GI) and managing a second in the William Hill Haskell Invitational Stakes (GI). The tables turned in the Travers. Settling in sixth at the break, Keen Ice had to make multiple maneuvers within the field to find racing room. Down the stretch, he was still in third, but a lead change and a right-handed whip by Javier Castellano sent the colt flying by a struggling American Pharoah to a three-quarter-length victory.